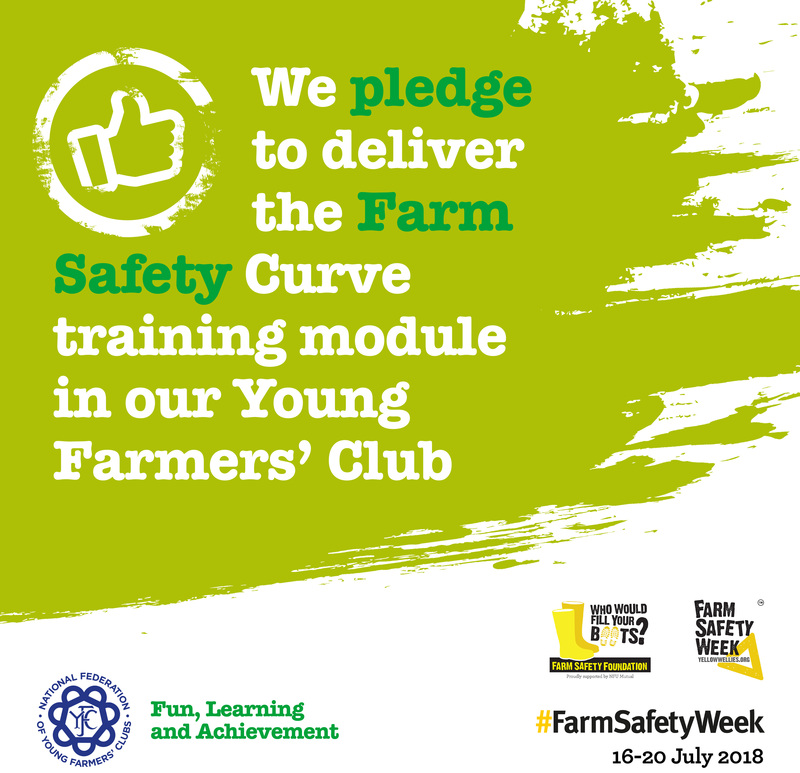 Thanks to amazing support from YFCs during last year's Farm Safety Week, more than 100 YFCs have put the Farm Safety Curve module on their club programme, which means more than 1,600 young people are more aware of the dangers of working on a farm. In 2018, we want to do even better! 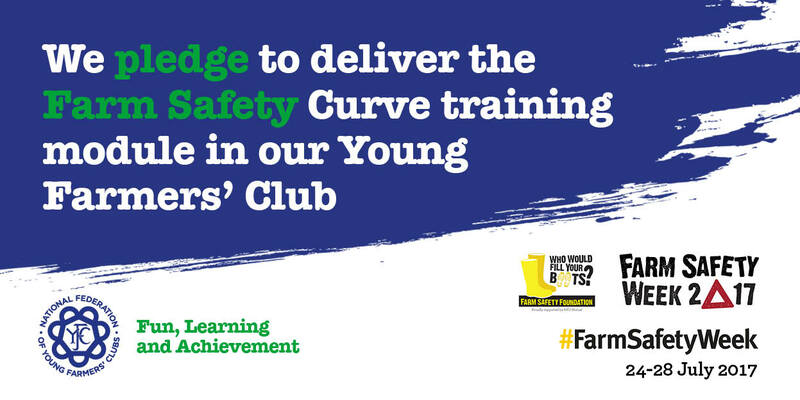 For Farm Safety Week 2018, we're calling out to the 500 YFCs who haven't run this training yet to please pledge your Club’s and County’s support to committing to put NFYFC’s Farm Safety Curve training module on your Club Programmes for 2018-19. Our pledge materials are available to download below and we ask you to use them on social media from 16-20 July for Farm Safety Week. If you have received the training already, there are some social media assets that you can use to join in during the week too and spread the positive message that you have done the course and are staying safe! 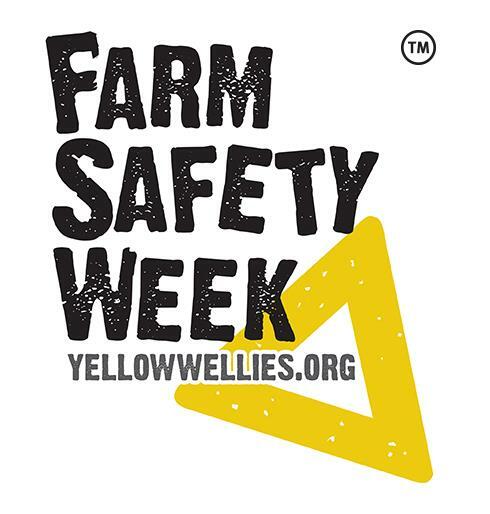 Farm Safety Week UK & Ireland is celebrating what 'good' looks and sharing good practice and the official message for the week is Your Health. Your Safety. Your Choice. Farming continues to have one of the poorest safety records of any occupation in the UK & Ireland but all the main farming organisations in the partner countries are working together for this week to address this. The latest annual figures from the Health and Safety Executive show that out of 144 people killed or fatally injured in workplace accidents last year, 29 worked in agriculture. The fatal injury rate for agriculture is 18 times as high as the all industry rate. 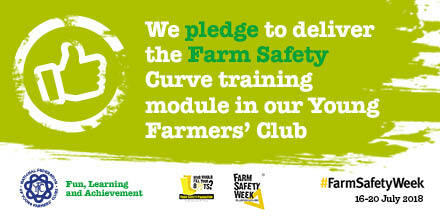 We want all our YFCs to run the Farm Safety Curve training module. It is a fun and interactive training session that has been developed with Yellow Wellies – and it could save someone’s life! So we’re asking all our YFCs who haven't delivered this training yet to pledge to deliver it and get the session on their Club Programmes for 2018-19! Show your support for Farm Safety Week by sharing our ‘pledge cards’ on social media, on your website and in your newsletters. 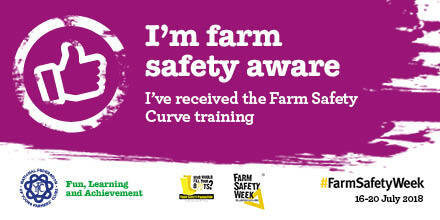 Let the world know that your YFC is committed to farm safety. If you have already received the training, then please feel free to promote your new safety-conscious self on social media during the week using the graphics below. Look out for more materials that Yellow Wellies and NFYFC will be promoting throughout the week. Use these and other available material to help us show that the next generation of farmers is taking safety seriously. 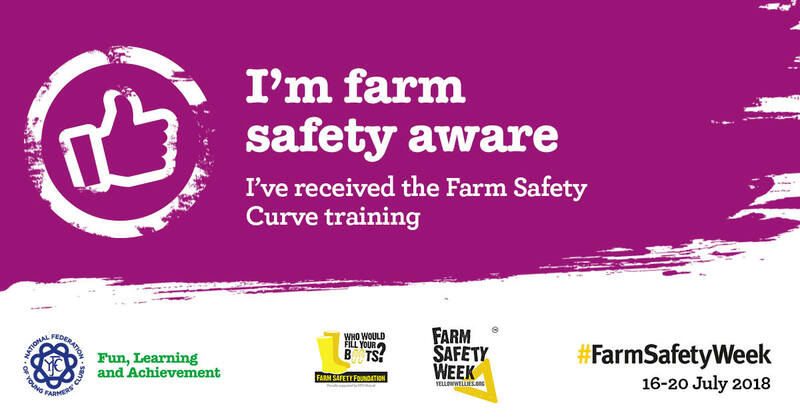 To book a Farm Safety Curve training session for your Club you can register interest using the form in the top right hand corner of this page (or scroll to the end of the page if you are viewing on a mobile). NFYFC will then help you to set up a training session using one of our accredited trainers. 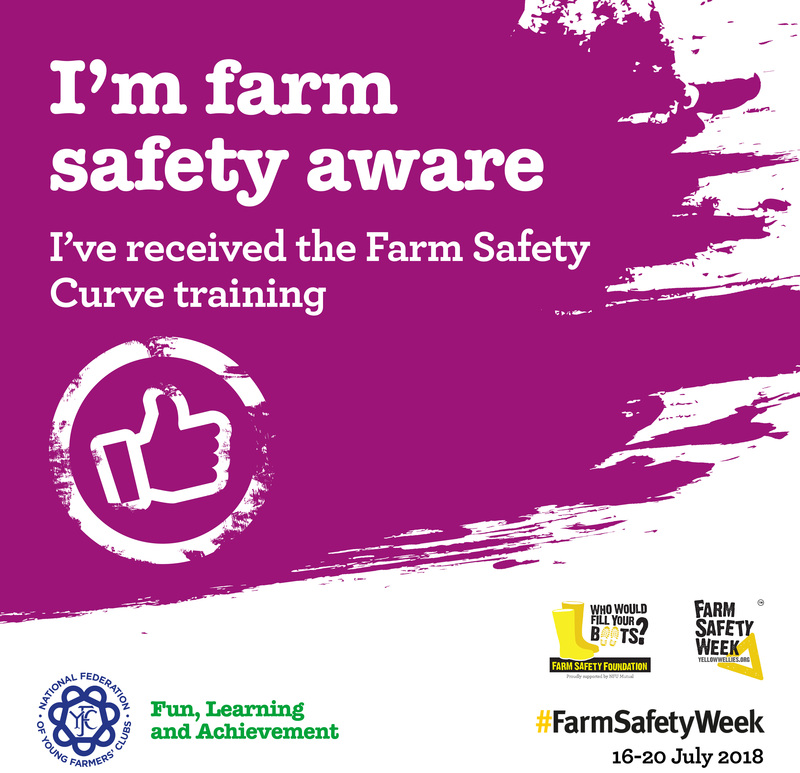 Curve training sessions can be delivered by anyone in your county who is an accredited trainer and registered with the training officer at NFYFC. Trainers are provided with a guide to delivering the training, and all the resources needed for a fun, informative session within your Club Programme including a certificate of completion. The sessions usually last around one and half hours. If you would like to become an accredited trainer for your county so you can deliver the training module, find out about the course here. You can’t work safely unless you know how to – make sure someone experienced shows you what to do or that you have been properly trained. Being hit by a moving vehicle, driven or runaway, is the biggest cause of fatalities. Keep pedestrians and vehicles apart if possible, ensure handbrakes are well maintained and follow ‘safe stop’ procedures (leave the gear in neutral, put on the handbrake and take out the key). Roofs are often fragile, even if they don’t look it. Falls from roofs cause several deaths every year. Treat all roofs as fragile and use equipment such as harnesses, coverings and guard rails. Riding a quad bike is not the same as riding a motorbike. Make sure that you are trained in the correct techniques and wear a helmet, as most injuries are sustained to the head. Livestock can be unpredictable even when you know them well. Using the right equipment and following safe working practices is better than trusting in the good nature of a bull or a cow and calf. Don’t forget overhead power lines – many accidents happen because people drive underneath power lines, forgetting that they are working with equipment raised. Slurry, effluent and moist grain stores are confined spaces and can all contain high levels of toxic gases – sometimes causing the death of a rescuer as well. You should never enter them unless you have made sure it is safe.